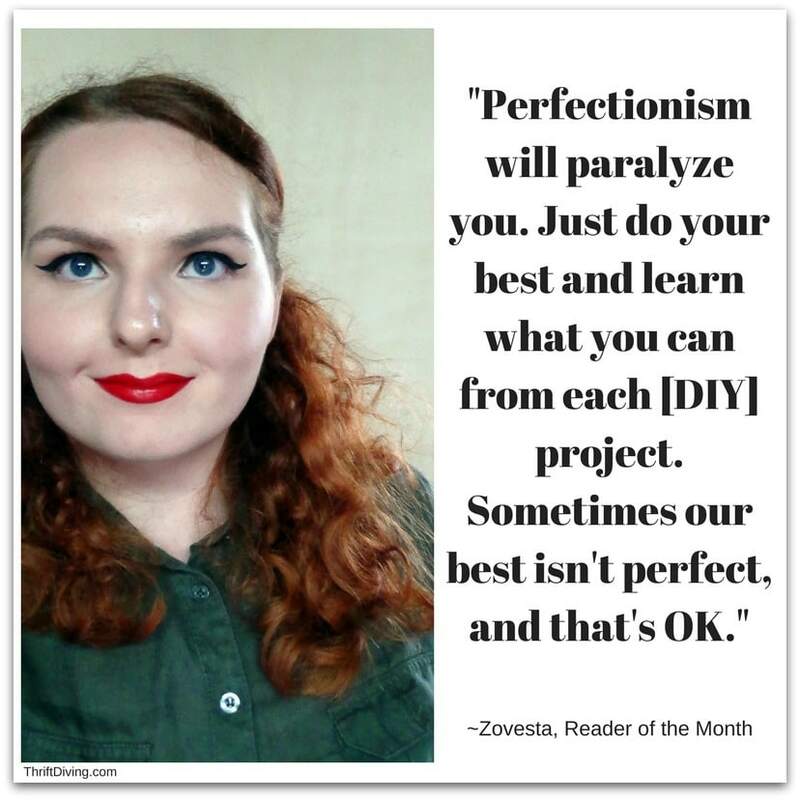 You are here: Home / Lifestyle / Featured Readers / Reader of the Month: Meet Zovesta! Some people measure success by the number of page views a blog gets. And while that’s important, I also judge the success of this blog by the number of people who leave thoughtful, genuine comments. It’s about the people who stick around and keep coming back again and again, sometimes for years! I also judge the success of this blog by the loyal folks who actually take the time to read my posts. They’re excruciatingly long, I’ll admit! HA! My readers mean everything to me, so I think to take a moment to feature my favorite reader of the month! 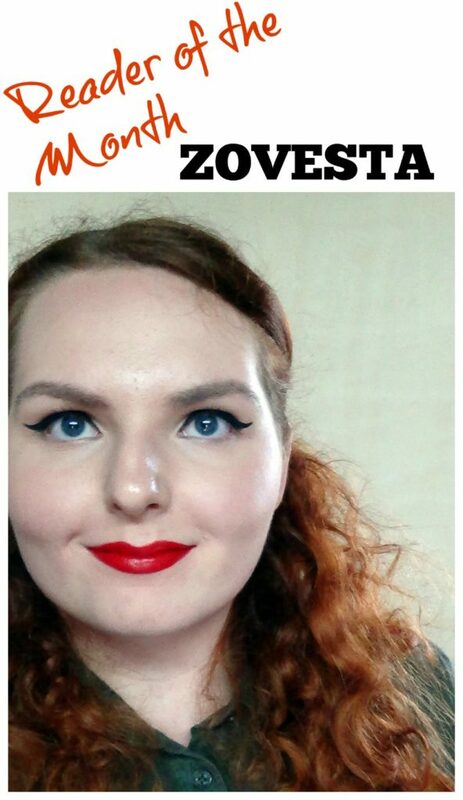 This month I chose Zovesta because she has been a loyal reader for about a year. I have no idea where she found me, but I’m glad she did. She leaves such great comments on my posts and I always look forward to hearing from her! You won’t believe how amazing she is. Keep reading to find out! “Hmm, that’s hard. I’ve been shopping at thrift stores my whole life. 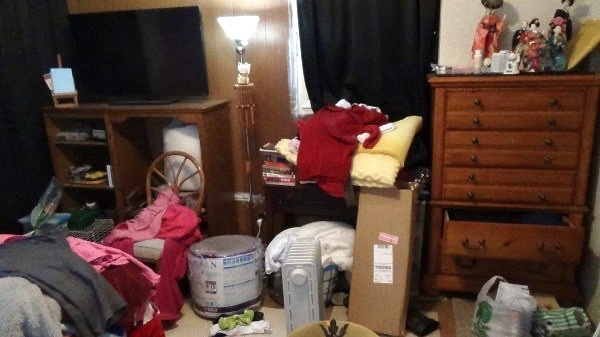 We’ve never been a wealthy family, so all of our home furnishings and clothes have come from the ‘big name’ thrift stores: Salvation Army and St. Vincent de Paul mostly, as we all find Goodwill too expensive! “Heh, probably my ‘Star Trek’ dress, which is a sort of black minidress with a high collar and long, billowy, sheer sleeves. It looks just like something someone from the original Star Trek series would wear, hence why I started calling it that! 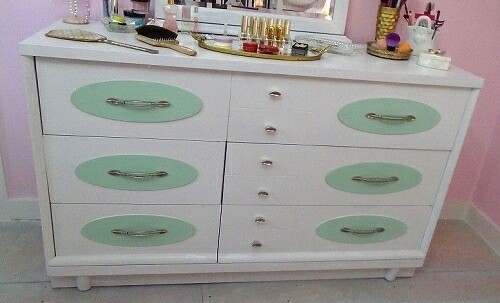 For furniture, though, I’m very fond of this 1960s dresser I found. I think it was 1964? I still have the original tag around someplace. I picked it out maybe 3 or more years ago and fell in love instantly. Although we saw a lot of other dressers at the thrift stores, this was the one I absolutely insisted on and wouldn’t budge. 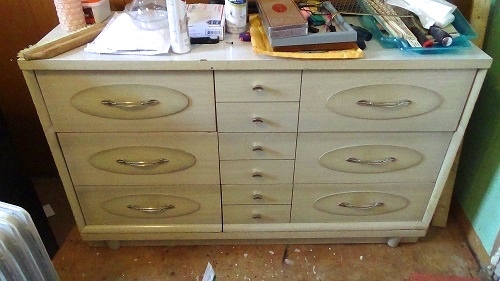 I don’t remember it costing a lot–maybe $40–and it was in great condition, a giant at about four feet across, with a sort of greige laminate all over it, and one stuck drawer. I ended up painting it and fixing the drawer, so now it serves as storage for my makeup, bathroom supplies, underwear, out of season clothes, etc. “Depends. I did a down-to-the-studs remodel of my bedroom (which also served as the storage room), finishing up just earlier this year, which is easily the project I’ve been most proud of! “About a year, but I could be a bit off. I’ve been hooked on Thrift Diving ever since I started reading it! I love Serena’s enthusiasm and friendly tone that comes out in every post, and I love the dedication to making her blog quality. Most of all, I love how she shares what she learns and teaches new skills and tips all the time! I follow a few dozen blogs, but skim through most of them because the content seems so fluffy and superficial–I always set aside time to read Thrift Diving because I know there will be content with substance! “Three tips: There are few traits as self-destructive as impulsiveness. Instead of spending a weekend trying to fix a project you’re knee deep in, spend an hour learning what to do, how to do it exactly, and if it’s the best option available! You can never know too much. Second: Perfectionism will paralyze you. Just do your best and learn what you can from each project. Sometimes our best isn’t perfect, and that’s OK. Okay, I don’t know about you, but I’m blown away by Zovesta! 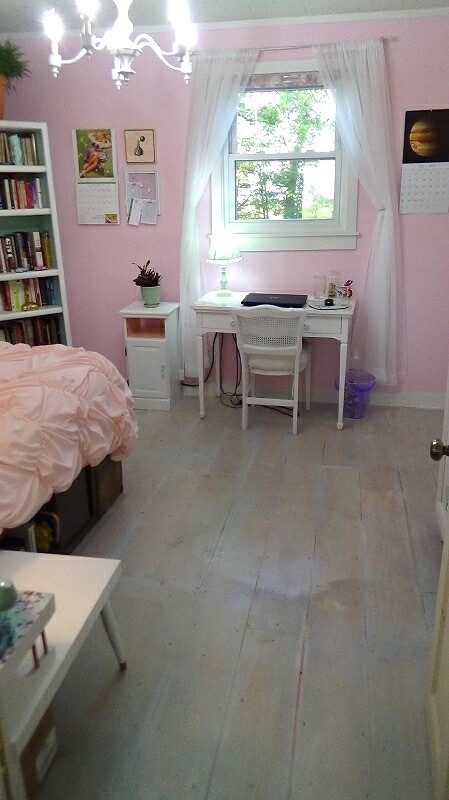 The fact that she has never done any major DIY, but yet somehow taught herself how to gut her bedroom and turn it into a gorgeous, pink Retro room that makes my heart happy, is downright amazing! Hats off to you, Zovesta! Keep going, girl. And her wise DIY advice about prioritizing what needs to be done in your home is sooooo true! I have been making this mistake myself. I’m pretty sure there are some bigger fish to fry in my home than what I have been working on. This might be a good topic for an upcoming post about figuring out what’s priority in your home. Thanks for that valuable advice, Zovesta! 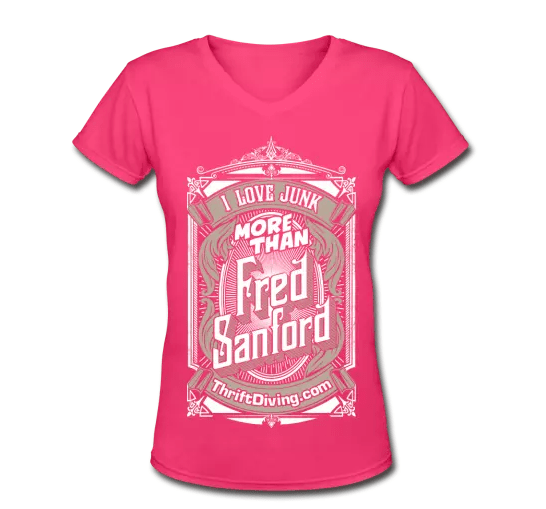 I Sent Zovesta My Famous “Fred Sanford” Tee-Shirt! If you’d like to pick up your own, you can click here to find your favorite size and color! 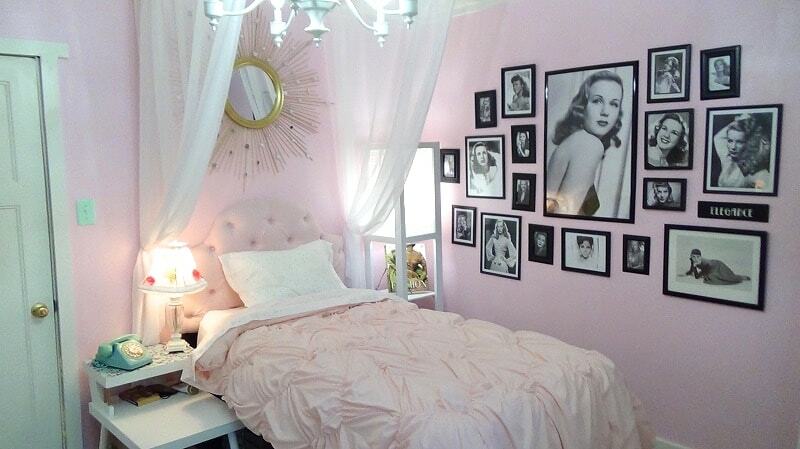 Love the bedroom reno Zovesta! Great job on the light. I love that you made it without any plans. Catching up on lots of little things today, and this one big thing–Congratulations, Zovesta, on a beautiful job! 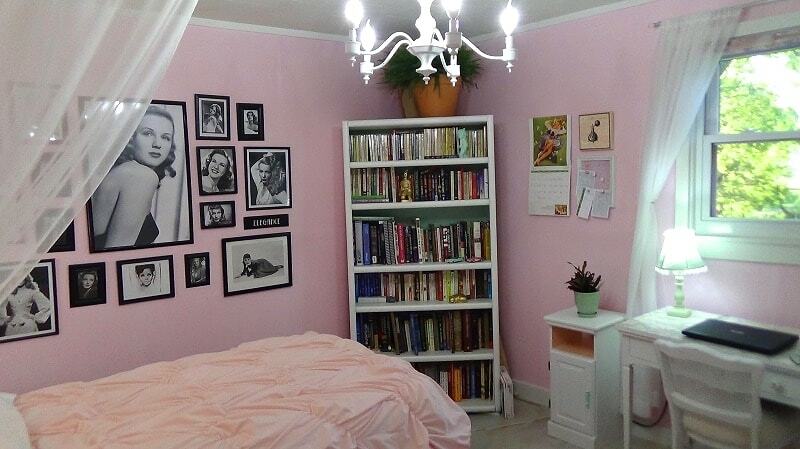 And I, too, really love how you made the room “you” with your color scheme and style. I believe you and Serena are so right about our home showing our personality. We are usually so careful with our clothing style and how we present ourselves to the world that way, but I think it’s just as important for our homes to reflect who we are, too. That’s one of my biggest frustrations (and part of my ongoing journey as a widow) since I rent. How do I reflect my personality when there are so many things I can’t change. But slowly, I am choosing/replacing furniture, colors, styles, etc., etc., and making my homes my own. I’m always so encouraged when I see beautiful examples like yours; it helps me keep doing the things that I can and letting the rest go. I loved your 3 tips, and especially what you said about your lamp, “It’s not professional, and it’s not perfect, but I like it.” That, to me, is the most important part of the whole DIY/remodeling/decorating process. Love what you do! Learning doesn’t happen in a moment, but if we are happy with our progress and enjoy our results as we go, the learning comes in due process of time. I love Serena and what she does/shares and I’m also looking forward to hearing more about your projects in the future. Keep rockin’! Zovesra, I actually did a little inside my head moan when I read “Hollywood Glamour” , but then I saw your after pictures and regretted everything that I have ever thought about that style! 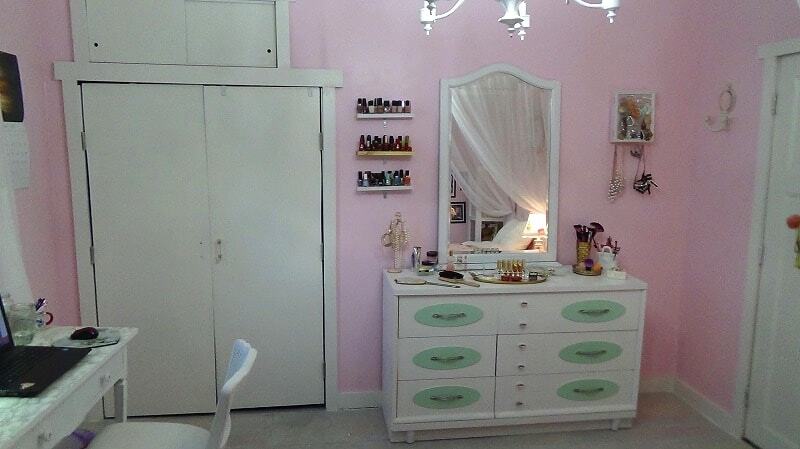 Wow, I love your room from top to bottom and from every side! “Nothing more than 30 dollars, down to the studs, and a simple light”, and you’re only a beginner? You are kidding, right! I think you’ve found a real hidden talent. What a great job. Wow! 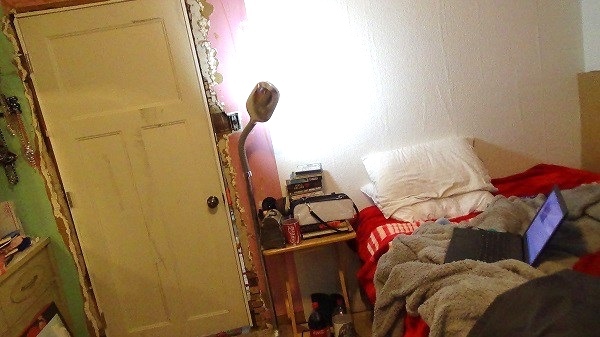 That room is just amazing Zovesta! You’ve got a natural talent when it comes to DIY projects! Keep up the great work!